Michael Rayner is defending the design of his first major project at his new firm, Blight Rayner. Rayner shocked the industry last August when he suddenly resigned from his post as founding director at Cox Rayner Architecture after 26 years at the helm to form a new firm with fellow Cox director, Jayson Blight. The respected Queensland architect said that he had grown tired of his managerial role at Cox Rayner and would be starting a new mid-tier firm where he could return to doing the things he loved most about practicing architecture. Now, in his first major public address since his shock exodus, Rayner has come to the defence of Blight Rayner’s design for the proposed $3 billion Integrated Resort Development for the Southern Spit at the Gold Coast, which has received some criticism from the public and environmental groups. 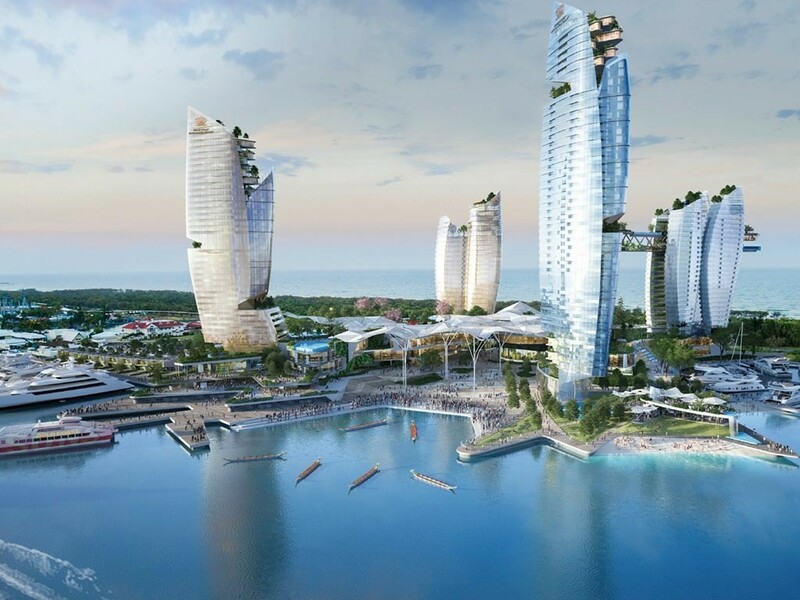 The development would see a new casino and a cluster of hotel and residential towers built on a five-hectare waterfront site on the Southern Spit between Sea World and the Gold Coast Fisherman’s Co-operative. It would also include a 7200sqm public piazza featuring multiple major restaurants and conference facilities overlooking the Broadwater, as well as a 1,200-seat amphitheatre and canopy, a water fall and public beaches. Environmentalists are reportedly concerned with the scale and size of the development, which is significantly above the area’s three-storey height limit, as well as the traffic congestion likely to result from people visiting and working at the resort. But Rayner has defended the project ahead of its public consultation period, telling the Gold Coast Bulletin that the project would capture the spirit of the Gold Coast and wasn’t just about putting more towers along the spit. “The area has a three-storey limit at the moment but the way I looked at it was that both Surfers Paradise and Main Beach have larger buildings coming in and this will taper down from 45 to 20 storeys as we continue the city’s edge and I do not see anything wrong with that,” he said. Rayner also said that the development could evolve into the most sustainable mixed-use development the nation has ever seen. “There will be plenty of environmentally friendly aspects to this including solar energy, recycled water from the towers being used in the gardens and could be the best multi-use environmental project in this country as we develop it,” he said. The project will undergo a public consultation period before the architects submit a detailed submission to planning midyear.